We can all agree that AMC’s ‘Mad Men‘ by Matthew Weiner is one of the finer shows to ever grace the small screen. And over the past several years, we have seen a variety of parodies based off this great show. Some have been comical to serious and smart, to low-budget, to down right silly. But we haven’t seen a top notch blaxploitation parody of ‘Mad Men‘ yet. Well that is until now. This might be the best parody I have ever seen. This four minute clip is for an actual ad agency called Leroy & Clarkson and features the characters from ‘Mad Men‘, but you know, in blaxploitation form. 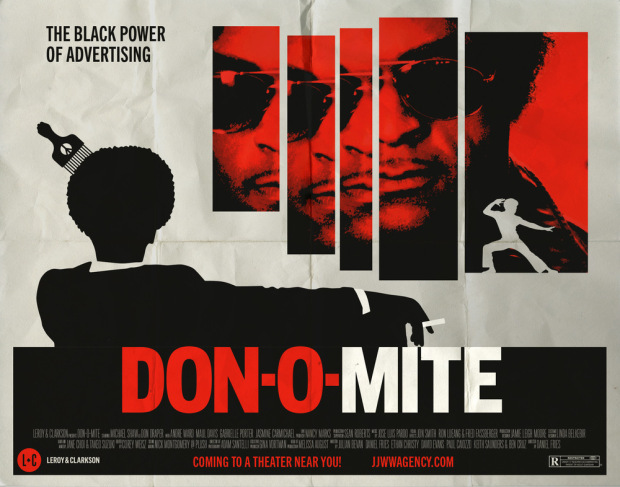 The trailer is called ‘Don-0-Mite‘, which is supposed to be Don Draper played by John Hamm. We see Black Peggy, Pete ‘the Soup Man’ Campbell, Sugar Hills Holloway (Joan), and Slim Sterling. This clip is executed very well and knows its Blaxploitation history very well. It’s as if they actually shot in the same studios as ‘Mad Men‘. And the characters are just perfect. After viewing this short film, I wanted to give all my money to this company to make a feature film version of this. I hope you enjoy it as much as I do. This entry was posted on Sunday, April 13th, 2014 at 11:17 am	and is filed under News, Television. You can follow any responses to this entry through the RSS 2.0 feed. You can skip to the end and leave a response. Pinging is currently not allowed. « ‘Game of Thrones’ Writers Set To Adapt ‘Dirty White Boys’!! !